Peel & grate 3 pds of potatoes. 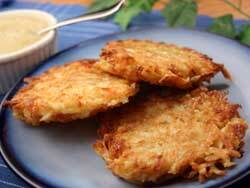 Combine the potatoes & 1 finely minced onion with 3 beaten eggs & 1/2 cup of seasoned dry breadcrumbs. Drop spoonfuls in a skillet with a little hot oil & brown on both sides.